We designed The Modular 3D-printable Castle Playset as a concept to demonstrate the potential of using 3D printers for home-based toy-making. As the pace of hardware development increases, the traditional ways in which products are consumed can be affected by a rapid adoption of maker tools, such as 3D modeling software, 3D printers, and laser cutters. During the past 20 years, the expansion of computing devices, digital cameras, and the Internet, created an infrastructure where individuals ubiquitously use digital tools. It has never been so easy for anyone to publicize text, images, and videos - directly from the comfort of one's home. Today, the same seems to be happening with the adoption of design software and manufacturing hardware. This democratization can drastically change the way in which we invent, distribute and manufacture products. Individuals will potentially be able to create and produce the products they need and desire. Modern digital tools, Creative Commons licensing, and the Internet as a distribution platform can create a new production era, which is parallel to the currently established methods. 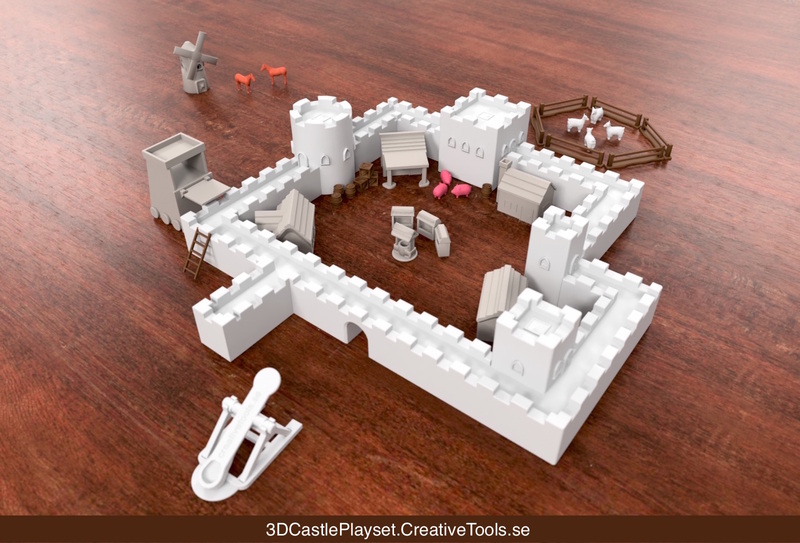 This #3DCastlePlayset aims to demonstrate that a fun toy can be defined, designed, distributed and adapted by individuals, using 3D tools and the Internet. The structural parts of the castle (walls, towers, etc) are modular and fit together via a standardized butterfly-joint. All parts are released under a Creative Commons - Attribution - Share Alike license. You can even use the files for commercial purposes such as 3D-printing and sell castle parts to anyone. You can download files free of charge from the following 3D printing file repositories. We recommend using PLA filament for its ease-of-use and being the most suitable plastic for 3D printing toys. You can use any 3D-printer that is compatible for use with PLA filament. Note! Contains small parts. Only allow small children to play with the parts of the #3DCastlePlayset, during adult supervision. Please note that this playset contains small parts. Only allow small children to play with the parts of the #3DCastlePlayset, during adult supervision. If you like this castle playset, please feel free to create your compatible 3D files and share them with other 3D printing enthusiasts and us. You can follow us on social media and on the 3D print repository site to keep updated about new file releases. If you have any questions or requests, feel free to get in touch with us here at CreativeTools.se.